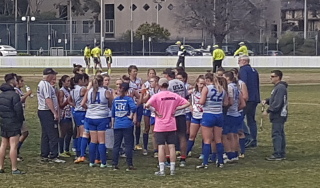 The USA Freedom faced the European Crusaders at Melbourne University Oval on Sunday morning, the last of three grading rounds for the women. The tournament had so far seen the USA lose to Ireland and defeat PNG. The Crusaders had lost both of their encounters and failed to score in either match. Those hoping for a close match would be disappointed. The Freedom went on to win by 127 points. Unfortunately for the Crusaders, not only does their losing streak continue, their scoreless streak does too. Jessica Estrada (#2) of the USA was outstanding with Lindsey Kastanek (#27) a great finisher in front of goal. Conditions for the match were good – a comfortable temperature, no breeze and limited cloud cover, although the oval was damp from the previous day’s rain. USA won the first clearance and whilst the first play did not result in a goal, it did not take long. After the USA had kicked two majors, the Crusaders looked like penetrating their Forward 50 for the first time, yet fell agonisingly short. Lindsey Kastanek kicked a brilliant goal in the latter part of the quarter, after a flawless centre clearance, but shortly after Catherine Hoha (#9) missed the unmissible. There was verbal encouragement of their teammates by the USA defence, who were largely kept away from the action. The USA led by 52 at the first change. Kim Hemenway (#13) kicked the first major of the second quarter, and Estrada added one of her own not long after, before the Crusaders manager to slow play down. The USA were more technical in their play, but by flooding the area around the ball with players, the Crusaders made it very hard for the Freedom to cleanly move the ball. The USA did manage two more goals before the quarter’s end, including a brilliant Estrada goal (she was unlucky not to add one more, with the ball ending up in the player on the mark). Bevin English (#5) took a great grab late in the quarter and the USA were up by 79 at the main break. The sun broke through in the third term and whilst the Crusaders still could not hit the scoreboard, they had their best quarter, restricting the Freedom to 16 points. Much of the quarter resembled junior football, with all players in the USA's forward half when the Freedom pushed forward, and only a handful of players staying back when the Crusaders went forward. The Crusaders, whilst far improved this quarter, were reluctant to pick the ball up, preferring to let their opponent take it, and attempt to tackle. It was a 95 point margin at the final change. Estrada opened the final term by running around two opponents to goal. The final term also produced play of the day, resulting in a Lindsey Kastanek goal. USA ran out 127 point victors. Goals: (USA) Estrada 5, Hemenway 4, Smolak 3, L. Kastanek 2, Nguyen, Leone, Klatt, Hoha, Armstong. Best: (USA) Leone, Brower, English, Estrada, Hoha, L. Kastanek (European Crusaders) Barisic, Duquet.